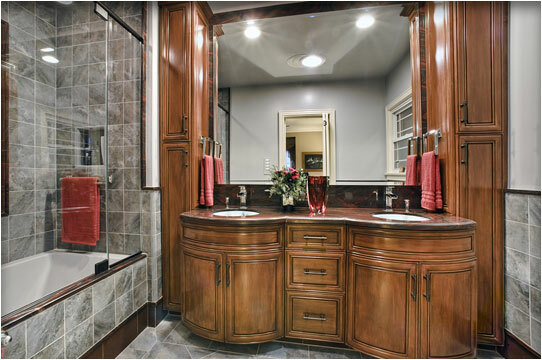 Latest Design Option 1-6, Remodeled Master Bath » Roger Perron Inc. Here is the remodeled master bath. A major transformation took place with the new efficient floor-plan design. The unique use of granite and tile with mosaic creates a blend that makes one want to croon. The curved sink base cabinets are custom-made by our cabinetmakers, an unusual delight to behold along with the rope lighting hidden behind the beveled mirror.